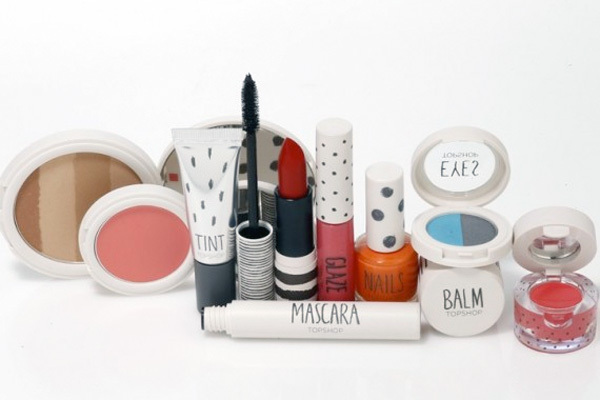 Much hype has surrounded the launch of Topshop’s make-up range. Us industry insiders have known about it for at least a year and some have been quaking in their boots, knowing that everything Sir Phillip Green touches turns to gold. I was so looking forward to checking out this anticipated range, especially as it’s recieved so much coverage in the media already. Our favourite high street chain launching their own slap? It must be top, no? Well, ladies I have a mixed review for you. The range itself is very striking (and very Topshop) with predominantly white packaging and with some funky patterns to boot. It would defo look great in your make-up bag and you certainly wouldn’t be ashamed flashing this lot around down the pub on a Friday night. It’s very contemporary, on-trend and different from any other cosmetic brand I’ve seen of late – but then we wouldn’t expect anything less from the holy grail of clothes. However, and this is a big however, I don’t feel that the actual product lives up to the hype. Although the range I saw in Westfield was extensive and contained very on-trend, vibrant colours (in the nail varnish and eye products in particular) the rest of the range left a lot to be desired. The eyeshadow was grainy, didn’t leave a very good pay-off (technical term for the intensity of colour on the skin!) and I could imagine scraping half my eye off in the process. The blushers were so bright and greasy they wouldn’t look out of place on a circus clown… I wouldn’t chuck away my Bourjois or Mac for this! There were some nice colours in the lip ranges and they seemed to be of better quality, although nothing spectacular, so this would be a safe bet. I havent tried the mascara, but knowing that you can get some incredible technology for under a tenner from some well established brands, I wouldn’t bet your pennies on it. I don’t normally like giving negative reviews as this isn’t what I’m about. However, knowing that so many people will rush out and buy this purely because it has a ‘Topshop’ label, I feel it’s my duty as a beauty queen to give you lasses the honest truth! If you fancy trying a bit of the stuff I’d recommend the nail enamel or the lipgloss – fail safe products that you can’t really go wrong with. But overall I think there are much better products out there that are much better value for money, while offering great results. My final word on the matter… don’t believe everything Toppers tells you!